Some of the coolest features of Excel are the simplest. The free “Interactive Features of Excel” template has what you need to learn all these tips and tricks and start to apply them to your own Excel endeavors. You can learn how to insert cool sliders, check boxes, and much more. If you’re ready to take your boring Excel template and bring them to the next level, then you need the free Interactive Features of Excel today. To get started, simply follow the set of guides conveniently given below. 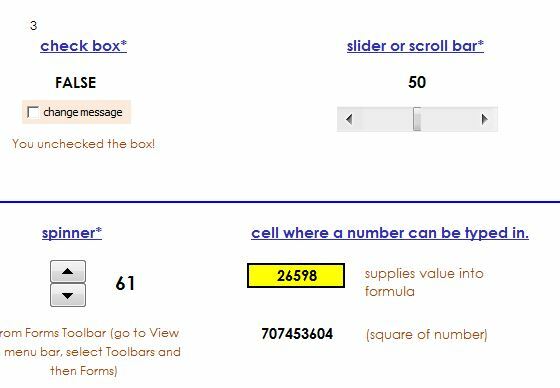 To download your new Excel learning template, you just have to click the link at the bottom of this page. When you have the document, take a look at the overview below. 1. This is an Excel workbook, including different interactive features of Excel like checkboxes, sliders/scrollbar, comments spinner auto generator, and hyperlinks. 2. Sheet 2 has more features like option buttons, list boxes, and drop down menus. 3. Sheet 3 shows a display table. 4. Sheet 4 shows a graphic table. All of the cool interactive items you see used in the template can be found in the “Developer” tab above. When you click on that tab, you will find an “Insert” icon with a list of drop-down items as well. You will use these to insert your own items, just like the ones you see in this template. To get the full range of items, go through this template and check out what all these tools can do for you. There are 4 tabs in all so be sure to check them out. Once you have determined which tools would be best for your project, follow the directions above to insert them. You can download this free template today by following the link below.